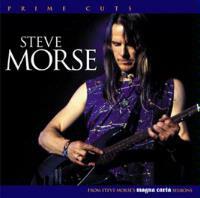 Joining Magna Carta's Prime Cuts series is this release of music by Steve Morse. The majority of the material comes from three solo albums of his, Split Decision, Major Impacts 1, and Major Impacts 2. There are, though, one song each from Magna Carta's first Rush tribute disc, Working Man, and their Yes round Tales From Yesterday. Rounding out the set are a song from Jordan Rudess' Wheel of Time disc, and one of a remix by Vapourspace. This disc gives a great overview of a lot of the moods and modes of this legendary guitarist, and would be an excellent introduction to the artist. Since I have reviewed many of the tracks presented here in their original release, those songs reviews are adapted from the original article for consistency. Picked guitar starts this, and a Squireish bass line joins in, giving the track a texture for a time rather like Rush meets Yes. Then a harder, more gritty rock and roll zone takes over for a while. The cut sort of alternates between those two places. A very solid progressive rock mode encompasses this track. Shortly after the intro, the number becomes distinctly Kansas oriented and begins building nicely, getting quite hard edged at times. Then Morse takes on some very Yesish textures. As it builds to a crescendo, the cut is reborn in an acoustic mode ala Howe that leads to a nice mellowish prog jam which also has definite Yesish stylings. The mellower mode ends the piece in great style. It seems like I would never hear myself saying that anyone's bass work would outdo Geddy Lee's, but here come those words. Billy Sheehan is simply awesome on this one. This instrumental is very effective and fairly faithful, but with a modernized sound. The result is a definite winner. This acoustic guitar solo is (obviously) a cover of the famous Steve Howe solo from The Yes Album, and is delivered in a solid, and quite faithful rendition. A quirky, at times hard-edged funky jazz jam is the basis for this instrumental cut. It turns to a great hard-edged fusion tone to continue the musical wanderings. A killer piano solo erupts at one point. This turns to an old school jazz groove at one point, then moving into funky fusionish modes. The next change is to more hard-edged prog meanderings. It then wanders into a triumphant prog exploration after a time. This composition really smokes. The Vapourspace album was a disc by Mark Gage (who works under the moniker Vapourspace) remixing songs from Magna Carta releases. In this instance he did what amounts to almost a remake of a remake in that the song in question originally came from Morse's first collection of homages to artists who influenced and inspired him, Major Impacts. In this case, Gage took on Morse's take of Led Zeppelin influences. This one features a good deal of the Indian influence often heard in Zep music. This one makes an electronification of the song, but leaves out the hard rocking segment originally presented. Morse's take on Bach, this one is suitably stylish and cool. 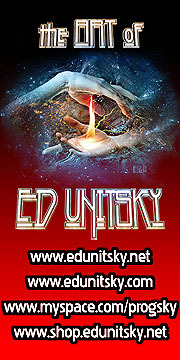 A tribute to the works of Crosby, Stills and Nash, this feels much like "Suite Judy Blue Eyes".